Current crude oil prices fell 3.8% today (Wednesday) thanks to the ongoing Saudi-Iran conflict and weak data from China's services sector. At 9:30 a.m., current crude oil prices in the United States were trading at $34.59 a barrel. WTI crude oil prices – the U.S. benchmark – have declined in every trading session of 2016 so far and are on track to close today at their lowest level since Dec. 17. WTI crude oil is down 6.6% this week. The current crude oil prices on the London exchange were even more volatile. Brent – the global price benchmark based in London – dropped 4.7% to $35.16 a barrel this morning. That puts it on track for the lowest settlement price in more than 11 years. It has fallen 6.7% in 2016 so far. 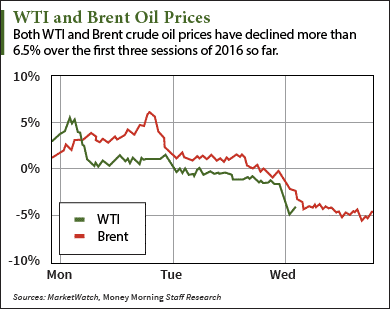 Today's drop in oil prices came on the heels of disappointing data in China. The Caixin Purchasing Managers Index (PMI) – an indicator of the economic health of China's manufacturing sector – fell from 51.2 to 50.2 in November. The decline marks the slowest pace of expansion since June 2014. A PMI of more than 50 indicates manufacturing activity is growing, while a reading under 50 means it's contracting. China's one-point drop shows how expansion of the country's economy is slowing, which means demand for commodities like crude oil is also slowing. But the biggest news affecting current crude oil prices has been escalating tensions in the Middle East. On Jan. 2, the kingdom of Saudi Arabia executed 47 people involved in the country's uprising during the Arab Spring. Among those killed was outspoken Shiite cleric Nimr al-Nimr. Since Saudi Arabia's population is mostly Sunni and Iran's is mostly Shiite, Nimr's death sparked protests among Saudi Arabia's minority Shiite population. The Saudi-Iran conflict has oil investors worried since both countries largely control the Strait of Hormuz, the world's most important oil chokepoint. About 20% of the world's globally traded oil passes through the waterway every day. But Money Morning Global Energy Strategist Dr. Kent Moors says there's another factor that will have an even greater influence on oil prices. In fact, he calls this factor the conflict's "flashpoint" because it could potentially spark total chaos in the Middle Eastern oil market….